A year ago today...... we said good-bye to a place we called home. A year ago today...... we hugged the doctors & nurses and bid them a sweet farewell. 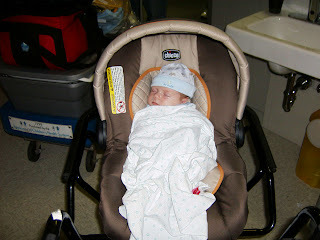 A year ago today..... we safely strapped you in your carseat for the very first time. A year ago today..... we wheeled our wagon of belongings down that infamous skywalk. A year ago today..... we rode together, our new family, home. A year ago today..... we held you, rocked you, fed you, kissed you, and watched you sleep in your new home. A year ago today..... we will never forget! 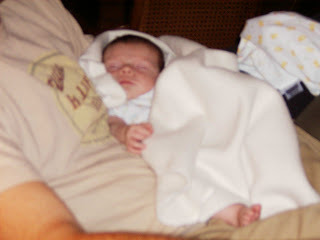 How quickly this time has passed, but how each new day brings adventure and something new to love about Braden. Braden Updates: He is so close to walking....he takes about 2.5 steps before he gets too scared and sits down. 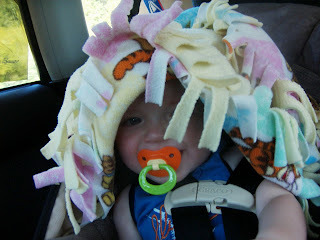 Last weekend, we spotted molar 3 breaking through....he's a tough cookie as he has tolerated all of them quite well. He is pointing and still saying, "That's a car" to every car he sees or hears. Just today he put the connection to Rich and da-da. Rich is hoping he will no longer call him "mama" or "mom." He's saying "nana" for banana and whole bunch of jibber with emotion, so we know he's trying to tell us something! We are anxious to see what Dr. Cava thinks of this growing boy as we venture to CHW on Monday, October 1st. My next update will probably be then as we will have "heart news" to update you with. What do 17,000 people and 45 degree weather have in common? A great combination for the 30th annual Brigg's & Al Run! Yes, it was a bit chilly, but we embraced the cool weather especially since most of our training took place during the hottest summer EVER!! What an awesome feeling it was to be among so many other people who were inspired one way or another to take part in this extraordinary event. 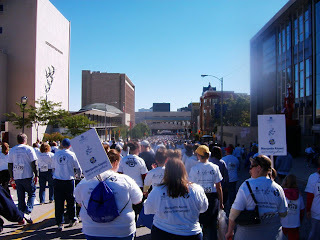 We had cheerleaders, a church choir, various bands, spectators, and even bag-pipes to cheer us along. We were able to see so many other teams with pictures and logos on the back of their t-shirts, honoring their loved ones. 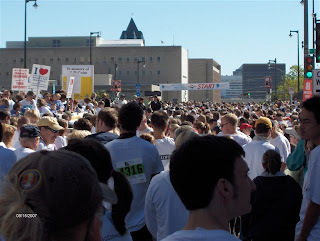 The hardest ones to see were those who were running/walking in memory of a child. It gets personal and a bit emotional when seeing this. I didn't cry (being the big sap that I am) except I did have tears in my eyes as Katie and I hugged at the finish line. Thanks Katie for running with me today...you rock! Grandma Lois, Rich, and Braden walked the 3 mile course. We ended up running into them when the runners and walkers merged....so cool! We had Uncle Larry, Aunt Marlene, and cousin Jesse to help cheer us along...thanks guys! There were festivities afterward at the Summerfest Fairgrounds. With the help of a Superman balloon, we were able to see Superman Sam's team amongst the crowd and wish them luck! Thanks to all of you who graciously donated to our team. As a team total, we raised over $1,000.00...yeah! Prayer Request: Our new heart buddy, Maddison, will be going in for her first surgery next Monday, September 24th. Please keep her family in your prayers this week as they prepare for her surgery. Please keep Maddison close in prayer on Monday. Well, it's time to hit the hay....boy are we pooped! Team Braden's Heart of Gold all set to go! Cousin Katie and myself waiting for the start! A great pic captured by Rich before the start. 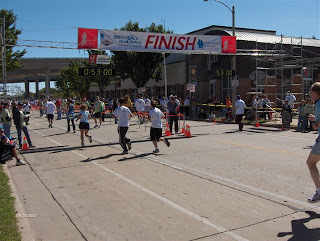 The Finish...under an hour...not bad for rookies! Auntie Marci gently telling B, "no stairs"
~Sorry if we stressed anyone out with not blogging last week....with school starting and trying to get back into routine (I think by May we'll have it down), it's been a little hairy around here :) We've been really busy and have lots to update....hmmm, where do we begin? ~First of all, we ventured to the U.P. last weekend for some Labor Day festivities. 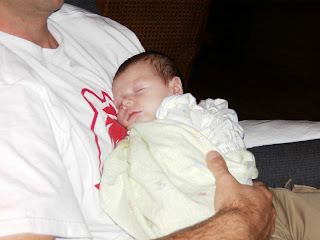 We got to spend lots of time with Grandma and Grandpa LaCombe, Auntie Marci and the gang. Braden impressed them with his crazy dance moves and new words. He has this fascination with trucks now....no influence by mom and dad....just something he picked up on his own. He even makes the noise and goes, "brrmmm truck, brrrmmmm truck" while pushing his little trucks and cars around. He now says car and we think he says, "That's a car" every time he sees a car. When asked what a doggy says, he pants like a dog. He's so darn funny and lets us know something knew he has learned each day. No walking yet, but he bravely stands alone. ~This weekend we had the honor of being apart of the 4th Annual Slager Bocce Ball Invitational. This was all put together by Sam's mom and dad. Every year they give the money they raise to a charity. Heart of Gold Charity was the 2007 recipient of this year's tournament. We were very honored to receive this generous donation and very proud of our friends who put together this great event. 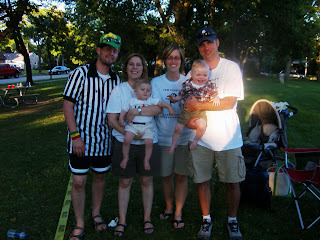 We were able to catch up with the Slagers (well Erika and I gabbed while the guys played mostly). Every time we get together, it confirms why our paths were meant to cross. The irony of it all was that just a year ago this weekend, we met the Slagers at CHW. 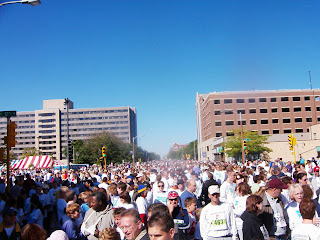 ~This Saturday, September 15th, is the Brigg's and Al Run. I'm so excited and I start to cry every time I think about it as I think of all of the families we will be running/walking with. Every person we will share that road with has a story, whether it's a miraculous or difficult story to share....we are all there for one purpose....for the children! Our donation page is still open if you would still like to contribute. 100% of all money raised goes directly to the hospital. 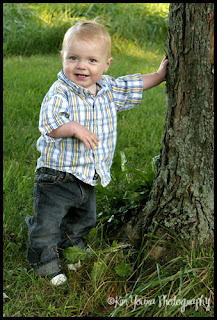 The pledge page is: www.firstgiving.com/bradenp Thank you to those who have generously donated. 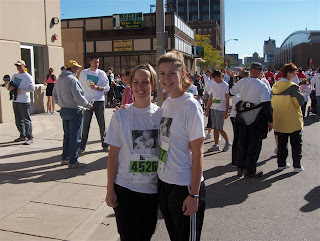 I will be running with Rich's cousin Katie. Rich will be walking with Braden and Grandma Lois. Go Team Braden's Heart of Gold!!! 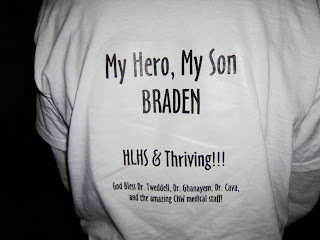 ~Upcoming events: Braden goes up to CHW on October 1st for a sedated echo. He will then return on the 2nd for a full scale developmental testing. This is something they do around 1 year for HLHS kiddos to see how they're doing (mobility, growth, learning, etc). We also have an appointment on Oct 1st with a social worker to help us with our charity mission. She seems really excited to work with us.....we can't wait! ~I believe that's all for now. 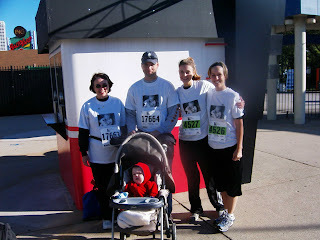 We'll try REALLY hard next Sunday to update on how the Brigg's and Al Run/Walk went. Before I sign off, I'd like to send some shout outs for birthday wishes. Happy Belated Birthday to Super Sam....he turned 1 last Friday. Happy Birthday to Grandma Patsy who turned ? TODAY, and Happy Birthday to Grandma Lois who also turns ? tomorrow!